The Kona Electric is not only fun to drive but offers exceptional travel range. 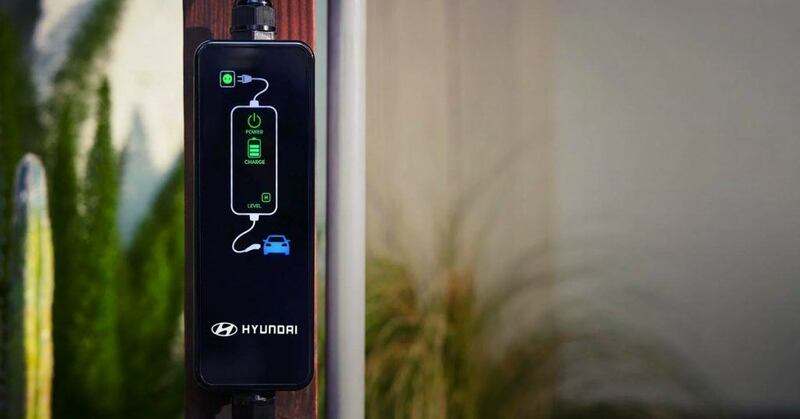 You can easily travel up to 415 kilometres with a full charge. 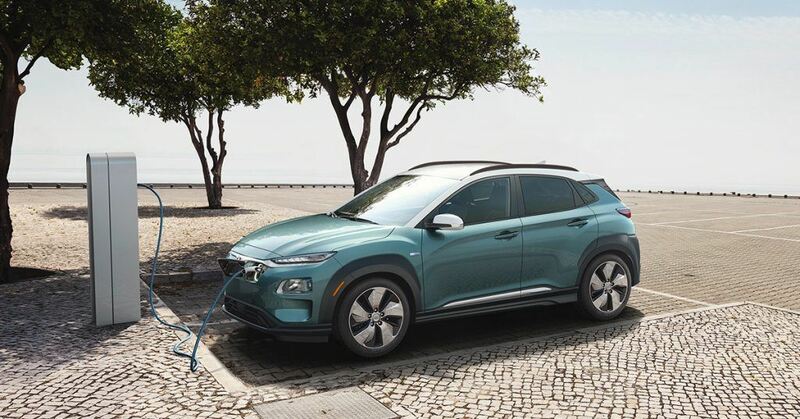 The Kona Electric can last long and is quick to accelerate from 0 to 100 k/h in only 7.6 seconds. *Charged with a Level 3 (100 kW fast charging station) charger. Enjoy the hill-start assist control. It detects inclines and helps prevent your Kona Electric from rolling back when driving up a steep hill between braking and acceleration. 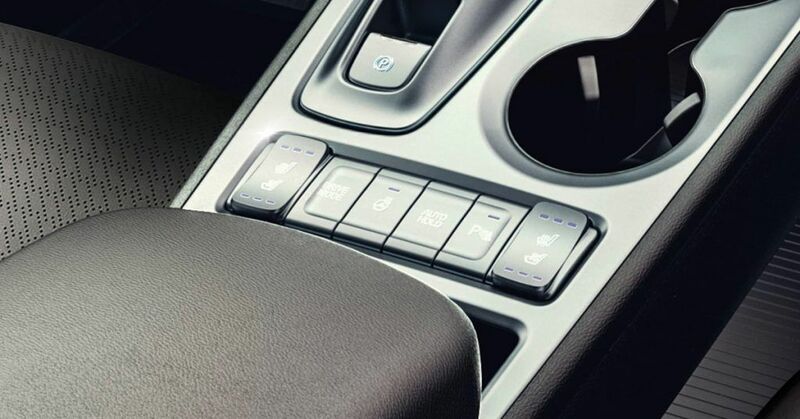 Adjust your steering feel and powertrain response to match your driving style with Drive Mode button. You can choose between COMFORT, ECO, ECO+, or SPORT. Reduce loss of electric driving range during the winter with the advanced heat pump system. It absorbs external heat energy and converts it into cabin heat. 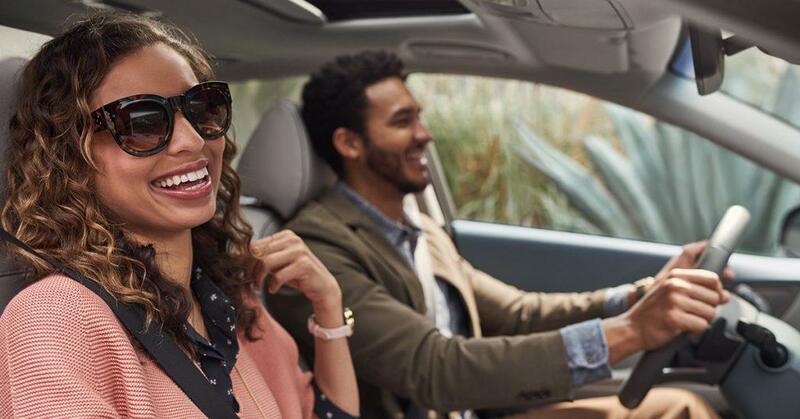 The standard 7.0" touch-screen lets you stream music from your smartphone, answer calls or make calls with the Bluetooth® hands-free phone system, and more such as rearview camera, Android Auto™ and Apple CarPlay™. The 8.0" touch-screen comes with a built-in navigation system. Unlock, lock, or start your Kona Electric with the standard proximity push-button. No longer will you have to take your keys out of your purse or pocket. With the Kona Electric you can enjoy heated front seats and steering wheel during the Canadian winter months. Enjoy ventilated front seats, to help you cool down during those warm journeys. The Kona Electric comes with an available Infinity® audio system which includes an external amplifier with 8 speakers placed inside the cabin for immersive surround sounds. 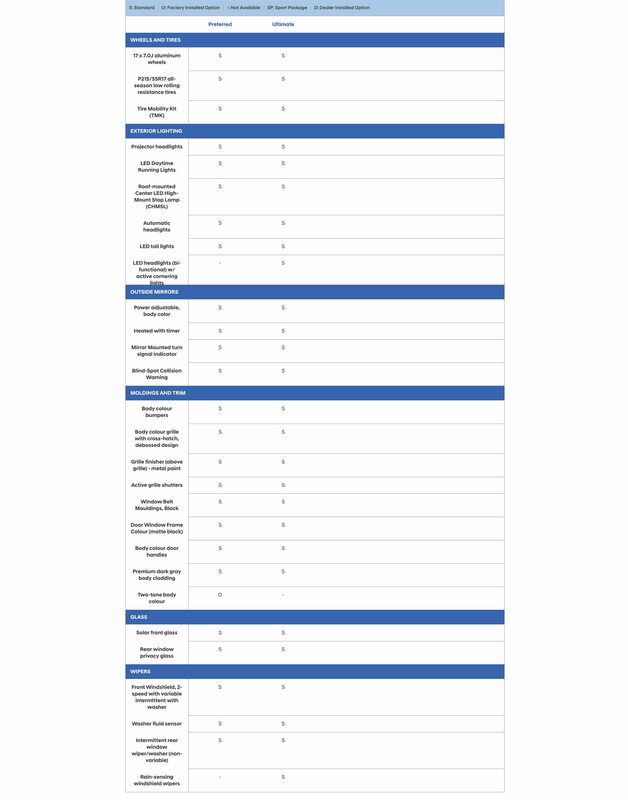 8-Way power driver's sear with 2-way power lumbar support. Driving a Kona Electric lets you set the seat to your preference. 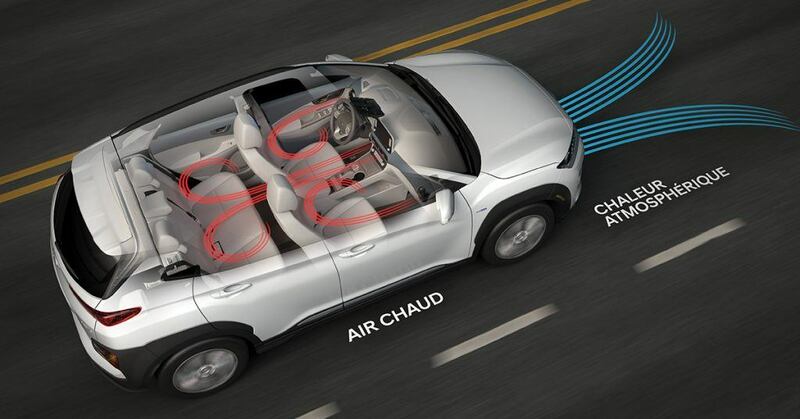 Control airflow automatically with Kona Electric's automatic climate control. 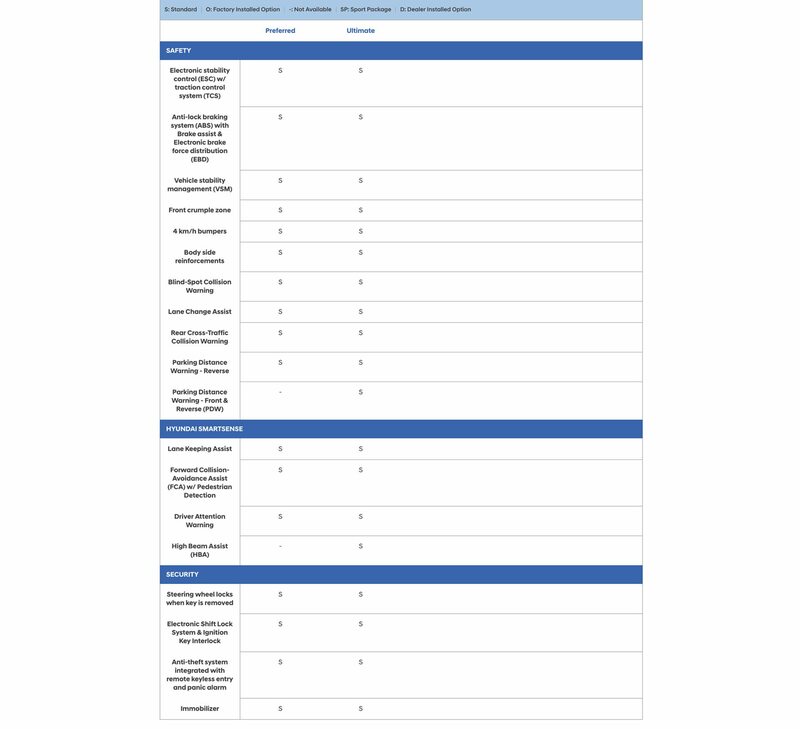 All you need to do is find your preferred temperature and let the system will continuously monitor the levels for you. With one-touch it slides open. Enjoy some fresh air or breeze on those nice sunny days with the power sunroof. The Kona Electric has 60/40 split-folding rear seats to accommodate your longer items. Also the battery is placed below the cargo floor, giving you plenty of space. The first-ever Kona Electric is expressive all-over and angle. The unique grille design does not only look stylish, it also features shutters that dynamically adjust to driving conditions. LED headlights with active cornering lights. The twin headlight design comes with standard LED Daytime Running Lights giving your Kona Electric a stunning front light signature. The cornering lights light-up the twists and turns as you move the steering wheel. The Kona Electric is sleek and aerodynamically designed all-around. The LED tail lights in rear bumper come with a slim design. 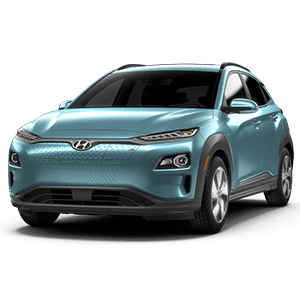 Kona Electric's back-side not only looks sleek, it is complemented with its rear spoiler, giving the vehicle a sporty look. Standard roof racks side rails are available on your Kona Electric so you can mount your favourite equipment. 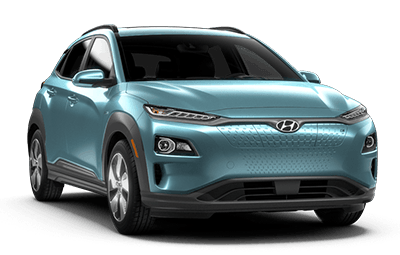 The Kona Electric comes with confident and uniquely designed 17" alloy wheels, optimized for aerodynamics for style and efficiency. 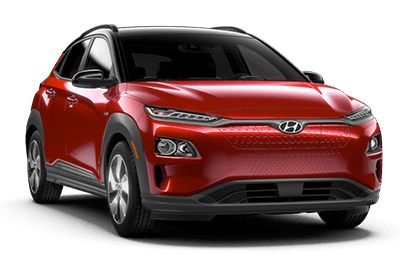 The 2019 Hyundai Kona Electric (EV), Preferred and Ultimate trim models qualify to Canada’s Electric Vehicle (Federal) incentive of $5,000*, starting May 1, 2019. Contact us for more details.